If you own or care for horses, then you know how important it is to have just the right kind of stables to suit both your property and your animals. 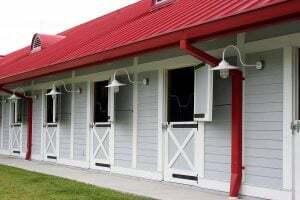 You may think that designing and building your own stable is a long and difficult process, but it may actually be a lot easier than you think. The key thing to remember when designing your stable is that the dimensions have to be just right. You should make sure that the aisles are wide enough for horses to pass through comfortably; usually, with enough space that two can get through is good enough. The stall areas themselves also need to be big enough where even your largest horse can easily turn and move around without feeling trapped. Taking into consideration room for storage and water facilities is also important as they will take up some of the space as well. The safety of both you and the horses is crucial to the design of the stable. The ceiling also needs to be high enough for the rider not to hit any light fixtures. Of course, all lighting should be kept out of reach of the horses for their own safety. Once you have everything planned out and measured, selecting the materials you’d like to use is the next thing to consider. A thick wood is commonly used, but we also have Durastall stables available as a good option. Drainage is almost a factor to take into consideration since used water and waste products will need somewhere to go. The best choice for the health of the horses is a good drain system that move liquid waste away, making the barn cleaner and fresher. Once you have all the plans laid out, the actual constructing of the stables is the easy part. If you order from us, not only will we take your blueprints and produce all the materials just the way you want them, but we will help you assemble the stable as well or just assemble it for you. With us, it is easy to design and build exactly the stable that you and your horses need. For more information about building your stable and our role in that, please call 1300 778 628.